SUSUTV have been getting their gunge on, all in aid of Children in Need. Taking place on the red brick outside the Student’s Union, every hour members have been set a different food challenge – including eating lemons, hot chillies and a lot of crackers! The public then have the chance to donate and decide who has tried hard enough to complete their challenge and who deserves to be gunged! 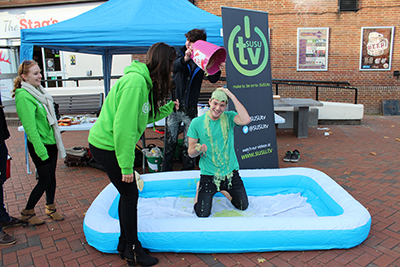 Chris Evans, Head of Original at SUSUTV, unfortunately didn’t try hard enough and was submitted to the gunge. So far RAG, Surge, SUSUTV have raised an impressive £1018.27 but if you’d like to help make it more make sure you come down and get involved in the fun and donate!